We recommend that you always show the columns from the pages mentioned below, so you can review the existing bates sequence, prefix and range as well. When you log in to your account, you can apply filters to find out if documents are already bates stamped in the database from the Add Case Documents, Browse and Search pages. Bates Prefix. 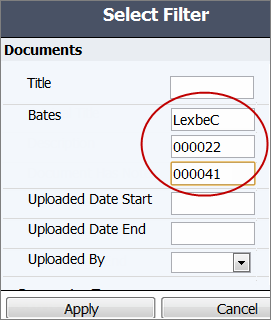 Indicates how a Bates number will start, such as LexbeC, which is usually the beginning letters (five or less) of your client in the matter, or another source. If you don't know the exact range and have the specif bates for a document, you can also use the filter and enter the Bates prefix/ Bates Start then click and apply. This action will also pull the files. If the Bates numbers are not displayed in Bates field, but in Title or Original Title of document, you can still can apply filters. 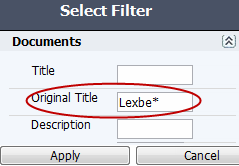 You can find the bates by using '*' in the Filter section. On this case you can apply either under the Title or Original Title the bates prefix and '*'. The asterisk * can be used at the end of a word/number as a wildcard in a filter to find content that contains words that have similar matters. Please note that this option will not bring the bates range in the results.